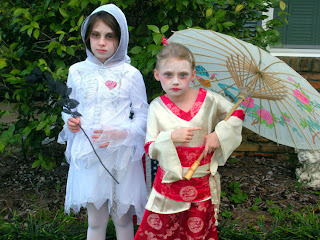 "Corpse Bride" on the left and a "Kimono Princess" on the right"
So Halloween's over now. The nieces had a nice time trick-or-treating with their dad. They got just enough candy to satisfy them, but not so much that we'll be throwing it out in two months. I got to hang out with Mawmaw to hand out the candy and check out all the other costumes. It was a night evening overall. Meanwhile, my mom and step-dad have taken off on a cruise for the week. They were even going to dress up for Halloween on the ship. My mom decided to go back to her roots and do the hippie-thing. She even requested that I make a few accessories for her costume. My step-dad was simply going to wear this t-shirt. 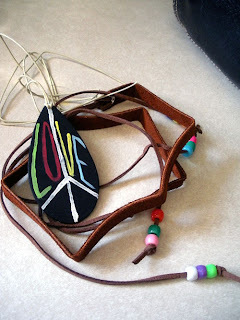 This is the leather headband and LOVE necklace that I made for Mama's costume. Since Mama and Danny are on the cruise, and the girls' dad has to go back to work offshore on Tuesday, I get to move in with them for the rest of the week to help out with homework and school transportation. As such, I'm finking out on the Meal Planning again this week. I have talked to my grandmother and know that we will most likely have tacos at some point during the week. Other than that, I'm flying by the seat of my pants since I don't really know what all my mom has stashed away in her freezerS. While I am going to be over there all week, I don't know what my posting schedule will be like. They don't have wireless, so I'll be working from an air-card most of the time. Of course, I also don't know exactly what I'll be working on yet since I'm having a hard time trying to figure out what of my supplies to pack. I've known this week would be like this for MONTHS and have seriously been trying to figure all of it out in that amount of time. You'd think I'd have a plan by now. NOPE! Instead, I have a general outline for what I need to get done today. It looks something like this. And, that's it. That's my day today. Fortunately, I got pictures taken and edited of everything I currently have made. So, I can spend some time this week writing descriptions and listing them, hopefully. I know the girls will keep me busy in the afternoon/evenings but while they're at school I'm hoping to get some work done. I guess I'll be getting a taste of parenthood this week. It'll be interesting. I think it's the early mornings that have me worried the most. I'm NOT an early riser by any means. I've already toyed with just staying up all night working and then napping while they're at school. It could work. . . maybe. Young me, now me is a site where people recreate pictures of themselves as kids in same poses/places. Okay, I've wasted WAY TOO MUCH time getting this written and really need to hop on getting some tasks accomplished from that vague outline. I'll be back when I can. Wish me luck! I love the Young Me/Now Me. That's just funny! Oh Ben, I'm so glad to see that you're still checking in with me. It's been so long since you commented, I wasn't sure if the girls and work were keeping you too busy. ;) I'm glad to see you are still around. Thanks!! I like your post. I love Friends too. That's so funny.